The July 19, 1921 meeting met in an open air meeting at Mrs. Woods. The president called the meeting to order and turned the devotionals over to Mrs. Stucks who was the appointed leader. 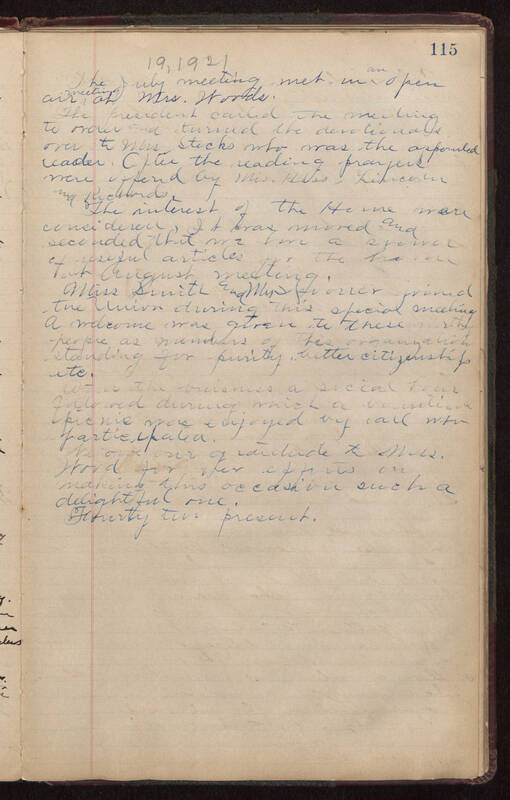 After the reading prayers were offered by Mrs. Hess, Lincoln and Richards The interest of the Home were considered. It was moved and seconded that we have a (illegible word) of useful articles for the hometown August meeting. Miss Smith and Mrs. (illegible) joined the Union during this special meeting. A welcome was given to these worthy people as members of this organization standing for purity, better citizenship etc. After the business a social hour followed during which a committee picnic was enjoyed by all who participated. We owe our gratitude to Mrs. Wood for her efforts on making this occasion such a delightful one. Fourty two present.